Vancouver | "It's fruitcake weather!" The everyday good and bad weather. I’ve always been quick to bring up the weather in conversations and despise myself for it. I never quite understood why so many of us do it. 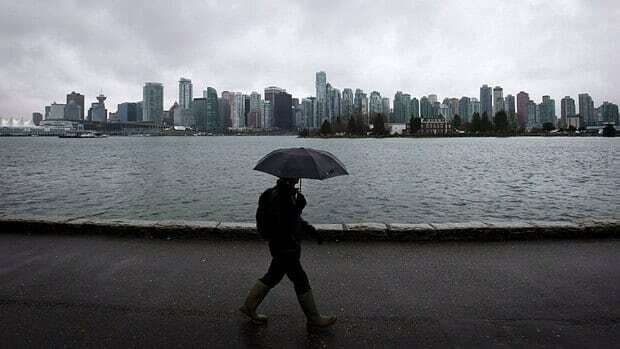 All those times we’ve found ourselves stuck on the train with someone we haven’t spoken to in months: “I hope there isn’t going to be this much rain on the weekend!” Blame it on living in Vancouver if you must. As soon as I bring up the weather topic in a conversation, I feel slightly uncomfortable. As if commenting on the rain will be the death of the conversation. There must be better things to talk about. Maybe we can think of it this way – we too often worry that anything else we bring up in conversation won’t interest the other person. Sure it’s not common for us to know too much personal information about our co-workers and acquaintances – but does that make it a bad thing to ask? Since when did asking how their parents are doing become classified as digging too far into uncommon territory? Not that I’m particularly preaching upon the fact that technology is making people extremely disconnected or whatnot. Certainly communicating through technological mediums did not suddenly make all of us decide that our only common denominator comes in the form of discussing the rain and how many umbrellas have been flipped. If you’re thinking this is about whether we’re being pessimistic or optimistic judging from whether the conversation is based around the rain or sunshine, you’d be wrong. Just because you sounded excited when mentioning the sunny weather doesn’t dilute the fact that you refused to make some sort of social connection. You might think that all the talk about the depressing rain is getting you down but maybe it’s just refraining from a social connection that’s hurting your personal well-being more. Mind you, it doesn’t always have to be an ongoing meaningful conversation or so to speak. What really matters is that talking about the weather or whatever your go-to topic of conversation is – stops becoming a repetitive fallback when you feel like there is nothing left in common. And hey, if you’re not a meteorologist or just someone that religiously refreshes the weather application on their phone every 5 minutes, I don’t see why the topic of weather should really extent beyond a minute at most. Stop being lazy and make a bit more of an effort tomorrow morning. Sure most days we wake up and it’s raining. Sure the commute to work is long and treacherous. Sure you feel just a little bit irritated when someone tries to start a conversation with you while your socks are wet. But who is to say it won’t be worth it if you’ve never tried? So Vancouver, here’s my challenge to you: The next time you feel a sudden urge to throw out a line about the weather, mention something more fun. Like seriously. Day after day you remained perched on my desk, guilt-tripping me at every glance for not picking you up again. I still remembered the day I brought you home from the store. There seemed to be an endless amount of potential that the words on your pages could bring to my life. In fact, I was more than delighted to have sent the little money I had on you, over what could have been a nice evening to the movies or a month’s worth of Netflix subscription. You temporarily deceived me into believing I was perhaps capable of becoming anything beautiful words could form: a writer, dancer, hippie, philosopher, entrepreneur…. there was no way I would’ve passed up the opportunity to know you. Let it be known I appreciated the knowledge I have extracted from our short-lived time together. But why must you continue to emit non-verbal judgement as I go about my daily activities? As of now, you represent everything I thought you weren’t. You represent my unfinished meals, undone chores, piling schoolwork as I engage with passive entertainment like surfing Youtube and social media networks. For weeks upon weeks I trudged to work, classes, and meetings with you. You would help me pass time with your many words of wisdom at the doctor’s office while waiting for an appointment. I couldn’t be more grateful but the weight you’ve placed upon my shoulders while in my backpack has no doubt made me shrink a couple centimeters if not more. I despise you for this. Shame. Now I’m beginning to question your value. You’ve hurt my ambitions to achieve greater things in the world of literature. Admittedly, I should have read you months ago whilst the wonderful summer rays but I procrastinated. Now my OCD is preventing me from neglecting you completely. I am unable to start again with other great written works because of your presence. All I ever really wanted was to maximize the lessons learned from you –not read every word you had to offer. Believe me, I wanted to learn everything when I caught sight of you. From insight on global economics to math to poetry. I convinced myself you were a worthy investment. Now tell me the honest truth –has anyone ever managed to intake your every word? Do they work? Are they users of public transit that trudge through the cold rain with you on their side? Have they elected to read you over papers they should have read for class instead? Perhaps they took you to more interesting places. Maybe they wrote their first published novel with you by their side, took you travelling and introduced you to everyone at a party. Your thoughtfully composed sentences certainly do deserve more than 15 minutes of fame. Don’t even get me started on your fictional counterparts! Such tall tales of magical kingdoms, wizards and vampires have had more than enough unwarranted exposure at the bookstore. Sometimes the story even turns into something like a bad pun. A considerable effort to convey a message but the bad punch line leaves a bitter aftertaste. The time I thought I was capable of burrowing through a 10 novel series has come and gone along with a series of unfortunate events. So, to the books I have neglected on my desk for too long, I can only say I want to be the ambitious ordinary superhero you told me I could be and reach my goals with the wise words you have kindly bestowed on me. Today, I have no choice but to retire you to my shelf along with some other dated folks and visit the bookstore again. I’d be the first one to admit to sleeping in late as a result of being a night owl and horrendous sleeping patterns. But recently I’ve had the pleasure of getting up at 6:30am to commute work at 8:00am. Strangely enough, this was not the most shocking change that crept up upon me due to my schedule change. 5:00am – The daylight starts creeping in your room. 5:25am – You open your eyes slightly to peek at the alarm. 5:35am – You realize it’s too late. 5:55am – You’re already awake. 6:07am – You debate getting up to make breakfast. 6:23am – You’re too lazy and decide to stay in bed. 6:30am – Time to get out of bed. You curse at the daylight despite buckets of downpour. On another note, I enjoy being up early quite a bit… just not the process of waking up. I now read the early morning news updates and listen to the radio while consuming my oatmeal. Ha. Did I also mention that I never appreciated quick oats before? I sure do now. In addition to all the exciting news updates, I’ve found myself catching some oddball morning exercise programs on TV (I suppose they’re aiming for their target audience to be more of the elderly providing the age of the hosts) but nonetheless something I was not aware of before last week. Might I say that it makes me wonder if I had the motivation of a snail? These elderly people inspire me. 6:53am – Nah, probably not inspired enough to actually start working out daily. So in the end I resort to watching more cat videos. Admittedly, Sad Cat Diary has been a favourite recently and I quote “This may be my last entry” –watch for reference. But hey, doing this for 5 mornings in a row can be pretty tough wouldn’t you say? Those early mornings create such opposing emotions. From rolling off the wrong side of the bed, to not being able to find the better half of favourite socks, witnessing the magic of quick oats, feeling motivated –and not. The best part about those early weekday mornings compared to those early weekend mornings is not having to aimlessly frolick around the house until lunch time. Let us embrace those early weekday mornings and the summer light that never lets us sleep.